I've been steadily following the work and development of NES Creative for the past year or two. Elizabeth Baudouin, half of NES Creative, reached out to me when our online magazine was first launching and I was really intrigued by what she was working on and we've kept in touch ever since. 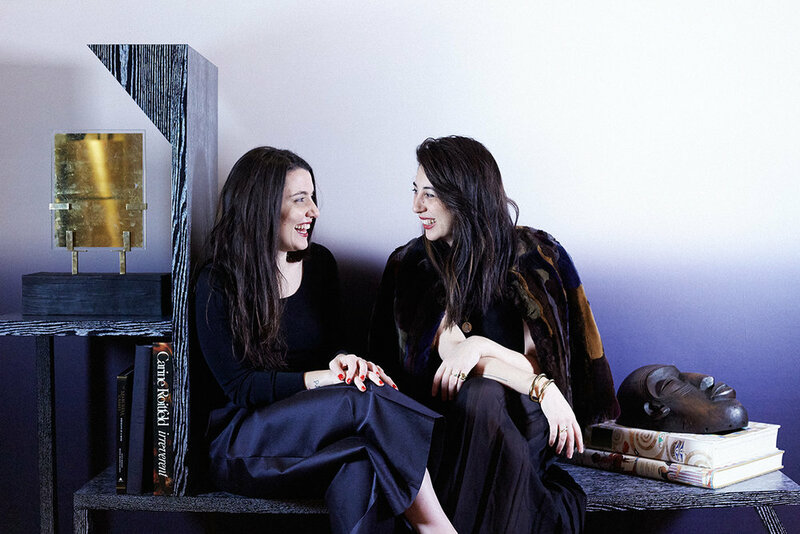 Natalie Shirinian and Elizabeth Baudouin are the boss power couple behind NES Creative. Creative strategists, curators, producers and lovers in New York City; they work with some of the biggest names in the US interiors and furniture scene. From curated events to marketing campaigns and more, these women are seriously impressive and not to mention probably one of the most beautiful couples in the big city. We sit down for a coffee to discuss how they got started between Los Angeles and New York, how they met and whether their relationship started with business or romance and how they now balance the two. I'm still in awe and inspired at how these super professional and hard working young women balance love, success and a hell of a lot of work with such a graceful ease. Join us for a coffee in their TriBeCa loft below! | Kristen | Could you please introduce yourselves and NES Creative? | Elizabeth | Hi! This is Elizabeth Baudouin and Natalie Shirinian. NES creative is a creative communications agency for the leading edge in style, design and culture. | Kristen | You have a great roster on your clients list, we’ve chatted for over a year or so, I see your beautiful Instagram images of your work and your inspiring design trips around the world and I’m so happy to learn more about everything that you guys do. | Natalie | Elizabeth's background is in the music industry and alternative marketing and communications for major brands and artists. Six months into dating, we took on a client together and it was such a natural and fun campaign - we kept taking more clients on together. Then about a year and half ago she became partner and now here we are. | Kristen | That sounds so rewarding when you can find the perfect partner in love and crime, and business! | Natalie | Thank you for the lovely compliment ! Truly inspired by fashion, design, travel etc.. Elizabeth and I also have a production company together 'NES FILMS' and we are producing my first film 'Interior Motives' a documentary on how fashion design and interior / furniture design connect. | Kristen | What does a typical work day look like for you? | Elizabeth | There is no typical work day. Our day to day is out of Spring Place in TriBeCa but each day is different 100%. | Kristen | haha I know I can imagine, same here. It is sometimes hard to describe! But maybe some things you do to give an idea of what it is like for both of you at work. | Natalie | We typically start with coffee and go through our many emails.. then we head to our work space which is at spring place. | Elizabeth | The fun thing about what we do is it's a lot about connections and story telling, so we spend a lot of time in the morning talking about what our clients have going on and how to creatively get their work out in the world. We're not a traditional agency in any sense of the word. We both have production backgrounds and alternative communication backgrounds, so each day is approached with the thought of how to best make it happen for our clients. We create trends, we create stories; we think about collaborations, events, etc. it's all about creating a vibrant community through the lens of NES. | Kristen | I always love hearing about when people’s backgrounds are slightly different to the traditional path or role to what they are doing now. I think one can bring a really new approach and perspective to their job when they don’t think about it in the same way that people who worked their way up traditionally through a proper agency would. | Kristen | Can you tell us a little bit about both of your backgrounds before NES Creative and Film Production and how did you first get interested in art and design? | Elizabeth | It's all about passion for the project, no matter what you are working on. And hustle, lots of that. | Elizabeth | I started in the music industry when I was 19 promoting bands and labels came to New York and started a record label and then went to LA to work for a major. When the music industry started to shift about 8 years ago I moved to the agency world building creative communication and alternative marketing plans for brands. Then I met Natalie...and well let's just say if she didn't ask me to join NES I would lose my job because I want to spend all my time her haha. Luckily we are both in the same field of promotion. | Elizabeth | I also write for some publications and have a producer blood so storytelling and make it happen attitude works for what we do. | Kristen | Perfect mix. | Elizabeth | The best part of what we do is getting to hang out all the time and have fun together being creative. | Natalie | My background .. long ago in my teens I started off as an actor (I still have my SAG card) ha. As I got older I realized I loved the production side of the business and the representation angle. You had more control and I loved seeing things come together. I worked in film production, then went on to work as a talent agent which lead my into Public Relations somehow... While I was working at a PR agency, before starting my own, I was simultaneously writing for publications as well like SOMA, and PAPER.. writing about design and fashion.. When I left the agency I was working for, I moved to New York and a book agent referred me to Mary McDonald and that's when I started my own thing. I kind of fell into representing the design clients, it really wasn't planned. | Kristen | Wow so interesting how one thing leads to the next. | Elizabeth | So funny right ? | Kristen | Yes! Its so amazing as you get older and as cliché as it sounds you can look backwards and connect the dots. | Kristen | How did you first decide to work together or to represent Mary? | Natalie | Well I was referred by a friend to this big shot book agent Jill Cohen because Jill represented Mary at the time and I think still does... Mary had just released a beautiful book out with Rizzoli and needed someone to get it out there. So I met with Jill and all she said was Mary will love you. I flew back to LA from NYC and I went over to meet her (which I was completely nervous about) and she invited me to her gorgeous home, where we had a conversation that lead to us laughing and really getting along - and there you have it. Cut to almost 6 years later and I can truly say Mary has been like family to me and pretty much my mentor in many ways. | Kristen | How did you decide to take that jump and really go out and start your own company? | Natalie | And honestly when you have a certain vision and have a distinct approach you really want to curate something of your own. I took a risk and wanted to make that happen. | Kristen | You’re 100% right. I do think it takes a certain personality to be an entrepreneur but you can also feel it when you have something you want to accomplish and you have a clear vision or how or why to do it. | Kristen | Was it difficult to find your first clients? How did you approach reaching out to them before you had a portfolio to show? | Natalie | I think there was a lot of trust there ... people that knew me would refer me and then from there it just happened. Word of mouth is great and I think people liked that I wasn't some robotic corporate agency. | Natalie | Mary was also such a big name and that was such a asset. | Kristen | Was it difficult to get out there what services you guys had or what you were then doing? Was it just a lot of networking? | Elizabeth | It was very organic. When you are in production and communication is all networking. Part of the fun is seeing what connections lead to where. | Kristen | Yes I can imagine! | Kristen | What was your first agency project? | Elizabeth | Natalie's first project was with Mary McDonald, her book. Her book with Rizzoli was my first big one. Book signings, dinners, events etc.. Then together I think it was Lauren Geremia - she's an amazing designer based in San Francisco. She was the first client we took on together. | Kristen | And what types of projects did you start with her? | Elizabeth | She's an amazing talent designing the offices of Dropbox, Instagram, Lumosity etc and she also does the residences of the company's owners. She's a RISD Grad, very cool and extremely talented. She supports the arts like no other. | Elizabeth | It's production life. All about waking up knowing anything can happen at anytime and to be ready for it. Balancing the multi task, the mono task, staff, clients, story production, campaign strategy, events. | Kristen | Ah I saw the Dropbox offices, absolutely stunning! | Elizabeth | We always get our daily coffee date in though :) It's been like that since we met, always an afternoon coffee even when I was at a different agency. | Kristen | Tell us a little bit about the services that you offer. What type of things do you do for instance with communication strategy and creative consulting? | Elizabeth | We offer creative services as a whole. Creative communication campaigns, PR, creative strategy, creative production, video, social, design, events, creative collabs. It's full service. We're an alternative agency. Our approach is 100% our own. Our team is terrific as well. | Kristen | So when you are working with a client for instance, what do you consult them on? Or do you come up with communication campaigns about how to get their products out and pitch that to them? | Elizabeth | It's an open platform for ideas our team always can bring their own twist to each campaign. It depends on their initiatives and goals. Can be a product launch, a store opening, a book launch, and brand launch, a party, a pop up installation, to get their own personal story out there on a mass level. It's about creating awareness and recognition for whatever is driving them at the the time and whatever they want out in the world and celebrated. | Kristen | Do you manage artists almost as agents? If so, how does that work? | Elizabeth | Not as agents, just on campaign, press, marketing, branding side. We have collaborators who are agents that we often work with. Part of the NES fam. | Kristen | Did you have experience working at other agencies before? How did you figure out the protocol for instance - what to charge clients, how to put together contracts (if you do that), business acquisition? | Elizabeth | We both have, which is a great learning experience. I ran an agency out in LA for many years with great mentors, so it was all very helpful. Natalie as well. | Kristen | Do you do different things in the company or do you do everything together? For instance, does one have certain strengths that they work with primarily etc? | Elizabeth | We both bring our separate strengths to the table for everything across the board. When it comes to staff and clients we balance management but we both are all in for creative concepts, strategy and execution. | Kristen | Do you each have a favourite thing you like to work on? | Elizabeth | Honestly, it's all really fun the most rewarding is hosting artist events at our space and seeing our clients so happy when they receive recognition for their work. | Kristen | It must be so rewarding to get the responses after the work that you do, to see how well everyone receives the work. | Elizabeth | To see our artists happy is everything. | Kristen | What were the hardest parts about opening your own business? | Natalie | I think it's a risk and you don't know what's going to happen - so there's definitely anxiety around that. But it's also the most rewarding because you're doing something you wanted to do for yourself and the risks and challenges are all on you, but it's definitely a way to learn and grow. | Kristen | What was one surprising thing you learned along the way? | Natalie | That if you don't have a plan B you will put all of your efforts into making plan a work. It's also interesting to see who supports you and who doesn't as things progress. | Kristen | I like that, to not have a plan B. | Elizabeth | That you can make love and work...work. | Kristen | I think you do need that motivation in a way that your project or initiative is the only option so that you do see it through. | Kristen | How did you two meet? | Elizabeth | We were both autonomous before we came together in work. So we have learned to work as a two instead of a one and it's fantastic. | Elizabeth | We met through a mutual friend Gloria Noto, who is a celebrity Make Up Artist and an Editor of a magazine we both wrote for. Our coffee meetings overlapped. When Natalie sat down I basically fell off my chair. Stunning. And funny. And so smart. | Kristen | and then you went on a date and the rest was history? | Kristen | I don’t know you both in person yet but from what I see on instagram you are like the beautiful power couple dream team. I think all of us want to find that! Modern love story. | Elizabeth | It took me ten years and having to travel 3000 miles to find this women. Worth the wait and everything that came before. | Kristen | So it was love and then business? Were you worried to mix the two? | Elizabeth | Totally love then business. It was a random thing to take a client on together. 100% organic idea. | Kristen | Is it difficult working with a partner sometimes? Hard to separate work and business? What are the advantages and disadvantages? | Elizabeth | It's really easy, actually. We are both programmed in the same way so it works out. We are very good about carving out babe time. | Kristen | What are some of your most recent projects? | Elizabeth | Romy Northover Salon No at our space, Callidus Guild x Dimore, Lo'objet store opening, Oliver Gustav NYC store opening, Material Lust annex, Voutsa Pop Up, Martyn Thompson London Design Festival. | Kristen | Do you ever work on a one off project with clients or is it more of an ongoing relationship with a lot of planning of different things involved? | Elizabeth | Both 100%. We also just opened the New York office 9 months ago. So been pretty busy on all fronts. | Kristen | What is a dream project of yours? | Elizabeth | Honestly all of our clients are dream projects. Our roster is super curated. To be what it is. So each campaign thrills us just the same. | Kristen | New York vs. Los Angeles - do you see a major industry and or work culture difference? | Elizabeth |The NY vs LA conversation could go on for hours. LA is great for makers and artists and to have space but for what we do we need the speed and serendipity of New York. | Natalie | We love how fast things happen in New York and love being here. | Kristen | Totally agree, I miss the energy of New York and perfectly put, the serendipity. | Kristen | What is the DNA of New York? | Elizabeth | It's evolution and pushing forward. Our TriBeCa loft is above the subway my great grandfather built. Progress. That's New York. | Kristen | Thank you so much ladies for your time and telling us all about what you do! Thank You Elizabeth and Natalie!